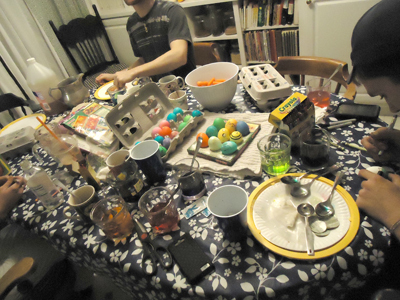 Our egg dying party took on a life of its own. My oldest daughter’s friend hoped I had “baked plenty of eggs” and after a piece of pizza, he immediately got to work. 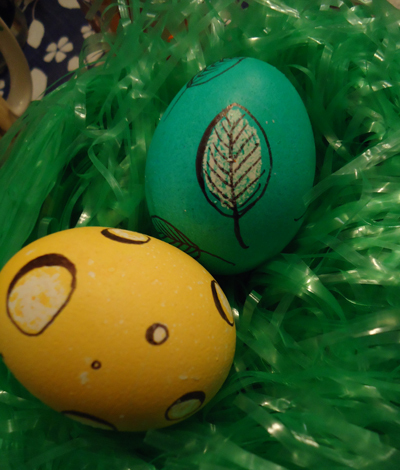 With all of his “instant ideas”, we knew he had been designing eggs for days. 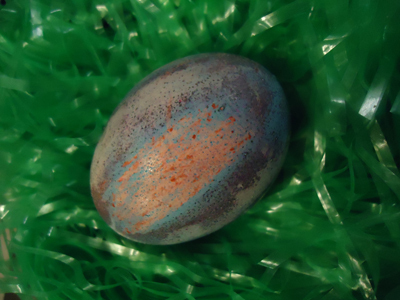 Others like myself simply dipped a few eggs to see if the advertised “new colors” were actually new. We recalled silly stories of years past. 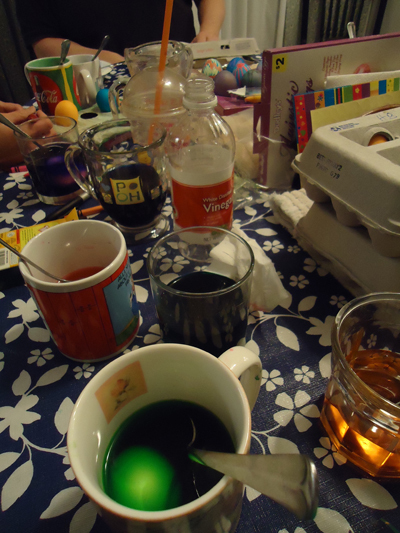 One year my husband accidentally reached for the wrong glass and drank a bit of green egg dye instead of his glass of soda. We were glad that they were non-toxic, though he did have a green tongue! I will never forget when my dad accidentally grabbed a dozen raw eggs and mixed them in with the hard boiled ones. 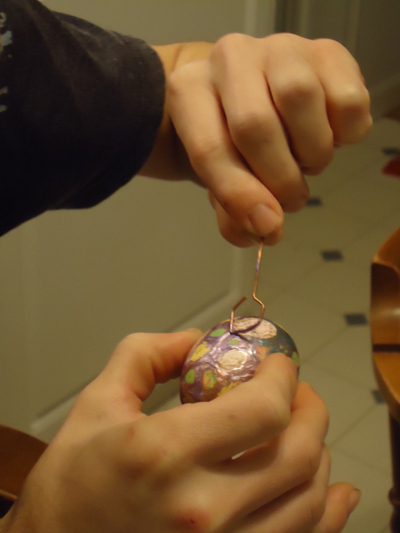 I still remember spinning and/or floating eggs before cracking them that year and it still makes me laugh! Nothing like the surprise of a raw egg! I can still hear my Dad’s belly laugh about that and I can’t help but wonder if he planned the joke as he enjoyed it so much. This year we followed Martha Stewart’s directions for cooking a perfect hard boiled egg. 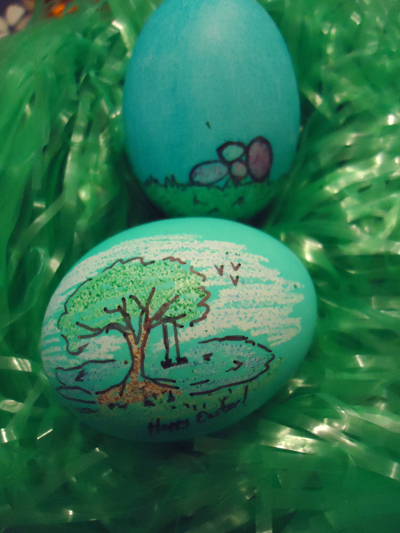 Isn’t it funny that any other time of year, boiling an egg doesn’t seem so critical, and you just do it, but when it comes to Easter, we always consult cookbooks or the internet to be sure that we do them right. Of course five dozen is a bit of an investment to be sure! 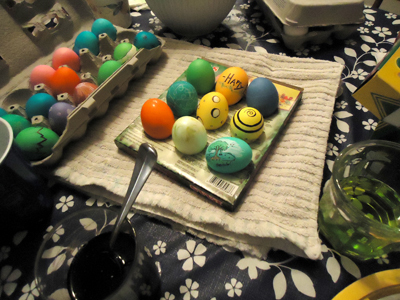 Our egg dying party has become quite the tradition even though my girls are grown. It is so fun when little activities done year after year grow to be the bonds that cement our family together, establishing traditions that are now firmly fixed. They look a lot fancier than any I remember dyeing as an adult or child! It gets more and more in depth and intricate every year! Its almost hard to crack into them!